In this installment of my column, we’re going to focus on an item that I’ve wanted to write about for some time: the Dibbuk Box. As luck would have it, this is another one of the “Big Four” haunted objects in Zak Bagans Haunted Museum. This allegedly haunted object first appeared in pop culture in a 2003 eBay auction from Kevin Mannis, a professional writer and recording artist from the Pacific Northwest (Broadjam 2018). In his eBay description, Mannis claimed to have acquired the box (thought to be a wine cabinet) at a 2001 estate sale. He proceeds to spin a tale of a paranormal experiences that rivals many horror films and seemed destined for the big screen itself (which it eventually did). The granddaughter also stated she and her siblings were always told it “was to never, ever be opened.” Of course, Mannis opened it once he got it home (I would too). Inside the box, he found several items: a 1928 U.S. Wheat Penny; a 1925 U.S. Wheat Penny; one small lock of blonde hair; one small lock of black/brown hair; a granite statue engraved and gilded with the Hebrew word shalom; one dried-out rosebud; one golden goblet; and a very strange black candlestick holder with the legs of an octopus. It didn’t take long for all sorts of Hollywood-horror antics to manifest including apparitions, people getting sick, and even causing a stroke. For a full description of those events, visit the website in the references below (Mannis 2009). So, what is a dibbuk? According to the Jewish Virtual Library, “in Jewish folklore and popular belief is an evil spirit which enters into a living person, cleaves to his soul, causes mental illness, talks through his mouth, and represents a separate and alien personality is called a dybbuk. The term appears neither in Talmudic literature nor in the Kabbalah, where this phenomenon is always called ‘evil spirit’” (JVL 2018). I also consulted my Jewish encyclopedia from 1966; “(Heb. ‘adhesion’) In kabbalistic folklore, the soul of a sinner which, after his death, transmigrates into the body of a living person” (Roth 1966). 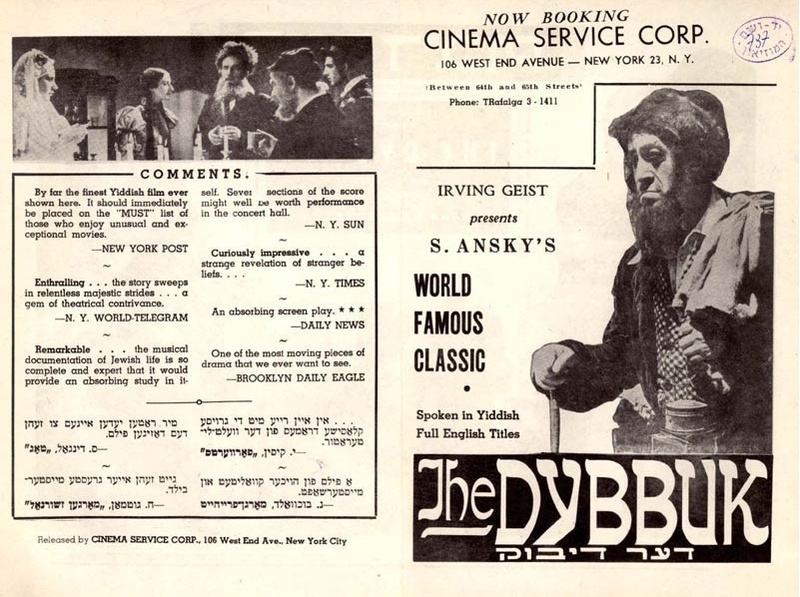 Advertisement for the 1937 film The Dybbuk, directed by Michał Waszyński. A search of various media revealed a play by S. Ansky titled The Dybbuk, written between 1913 and 1916, making its stage debut in 1920. The play was adapted into a motion picture in 1937. The idea of trapping this spirit inside a box was never brought up. Brian Dunning, in an episode of his Skeptoid podcast, points out “the word (Dybbuk) comes from the Hebrew verb ‘to cling,’ so a dybbuk is specifically a soul who clings to another. Nowhere in the folkloric literature is there precedent for a dybbuk inhabiting a box or other inanimate object” (Dunning 2014). My own search also did not find any mention of these spirits of folklore ever being trapped in a box—until Mannis’s 2003 eBay auction. The eBay auction was won by a Missouri student named Iosif Nietzke (username Spasmolytic) for $140. After claiming the box did all kinds of horrible things to him, Niezke re-listed the box on eBay eight months later. The winning bidder was Jason Haxton, museum director at the Museum of Osteopathic Medicine at A.T. Still University in Missouri (username Agetron). In an interview Haxton gave in 2012, we find out Haxton learned of the box through one of his students; the roommate of Iosif Nietzke (Campbell 2012). Haxton eventually purchased the Dibbuk Box and wrote a book detailing all the Hollywood-horror style experiences he claimed to have happened to him: bloody/bleeding eyes, choking on water, full-body welts and hives, and so on (Haxton 2011). Eventually the entire story found its way to Hollywood and inspired the film The Possession, produced by Sam Raimi. I learned that in 2016 Haxton donated the box to Zak Bagans, star of the TV show Ghost Adventures. The Dibbuk box was put on display in his Haunted Museum, surround by (more than a grain of) salt and under a protective case (Bagans 2016). This is where I saw it up close during my visit in October of 2018. See my review of this Not-So-Haunted museum (Biddle 2018). I’m not going to focus on the paranormal claims associated with the box from the various owners, because that would be a fruitless endeavor; there is simply no physical evidence of the claims to examine—just anecdotes that amount to nothing in the way of objective evidence implicating the Dibbuk Box as the cause. 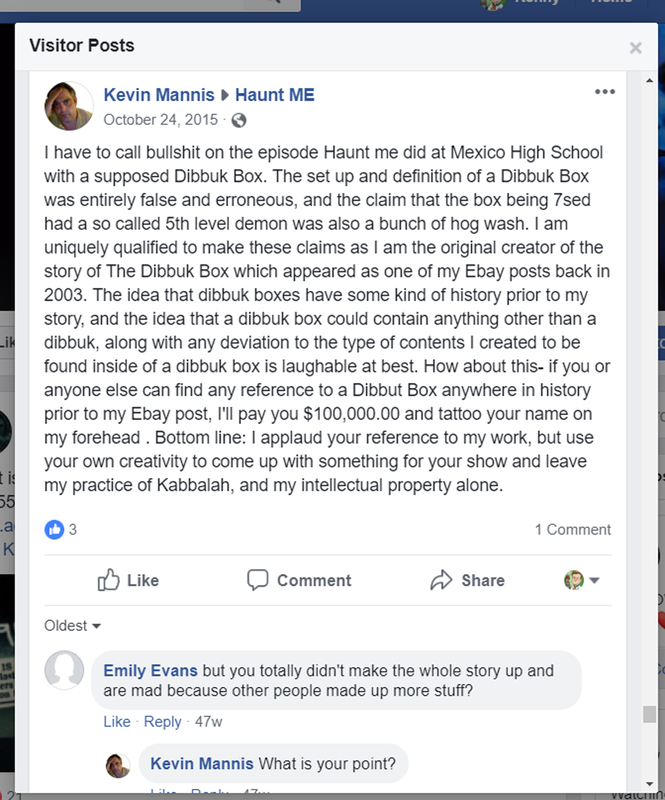 What I do plan on focusing on here is the question of whether the Dibbuk Box was a fabricated attempt to earn some extra cash and inadvertently became a paranormal pop-cultural icon. When I began researching the history of this box, it appeared that Haxton was the driving force behind the box becoming popular in the paranormal community. Although Mannis was the first to write about it, his eBay auction never reached the viral status a seller hopes for. Haxton published a book in 2011 entitled The Dibbuk Box, which reached a much wider audience and solidified the object’s place in paranormal lore. This book straddles the line between “it’s haunted” and “it’s a hoax,” never making a final decision and evoking the trite, open-ended method of “I’ll let the reader decide.” I’m not a fan of such approaches, so I took a closer look at Haxton’s time owning the box. On a website dedicated to recording the various traditions and folklore surrounding the Kirksville area, best-known for being the home of Truman State University and A.T. Still University, I found the Dibbuk Box in a featured story. Before I read the story, there was something that caught my attention: a photograph at the head of the page of not one, but two identical Dibbuk boxes. 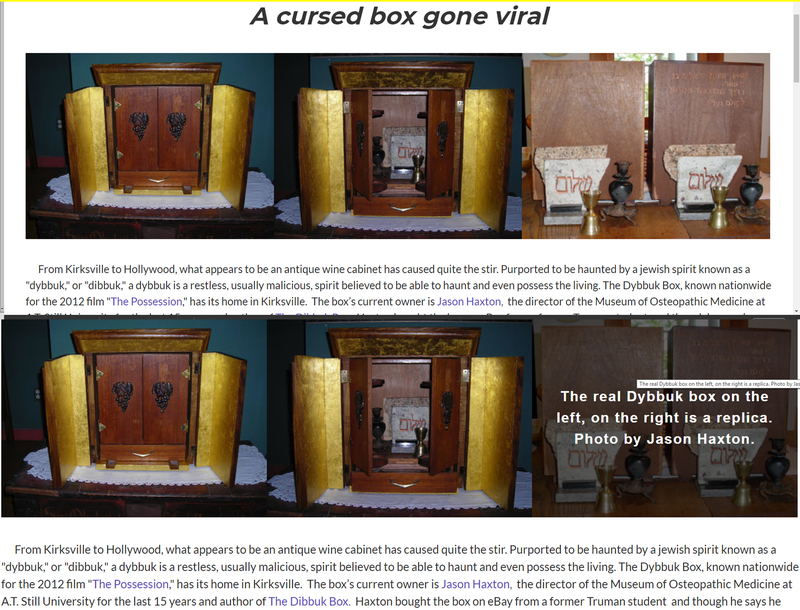 When I went to click on the image, text popped up over the photograph stating “The Real Dybbuk box on the left, on the right is a replica. Photo by Jason Haxton” (Payne 2016). Screenshots from website showing both the original box and the replica side-by-side. Front view of original and replica boxes open. Apparently, no one was worried about the Dibbuk escaping. The image only showed us the back of the boxes, in which both had a Hebrew prayer carved into the wood. However, we could plainly see that Haxton had found and/or fabricated duplicates for three of the larger items that were inside the box: the granite tablet with Shalom engraved on it, the golden goblet, and the candlestick holder with octopus legs. The story on the website stated that Haxton buried the box somewhere on his property and “claims in his book that he won’t tell anyone its true location until he dies and keeps a replica for media purposes” (Payne 2016). I ordered Haxton’s book to read about his side of the story and confirm the claim he had buried it on his property. The last location he mentions the Dibbuk Box being stored appears on page 146, “I shut the doors of the ark, sealing the Dibbuk Box within, and carted the whole thing to the attic.” I found no mention (in the book) of him burying the box, except for the idea of having it buried with him when he died. However, on the episode of Deadly Possessions, Haxton does state he had buried the box on his property. With a bit more digging, I found another site showing the replica box in progress of being built side-by-side with the original (Macabre 2015). What struck me as odd was that in the photograph, the original box—which is supposed to be housing a dangerous Dibbuk spirit—was wide open and didn’t have all of its contents inside (the granite tablet was missing). I guess Haxton wasn’t worried about the Amish people being harmed or cursed by the Dibbuk Box (Macabre 2015). I was a bit upset with myself for not knowing there was a duplicate before I visited Bagans’s museum. The photo of the two boxes side-by-side showed an obvious difference in the wood grain on the back of the boxes. If I had known this, I could have figured out if this was the original or the replica. However, something else immediately caught my attention: the granite tablet. Two distinct features stood out: the shape of each rear granite slab on the left side was different from each other, and the unique patterns of the granite were very different. My next step was to check the episode of Deadly Possessions in which Jason Haxton presents Zak Bagans with the famous box, donating it to the museum. I wanted to see if there were any shots of the contents and/or the back of the box to determine whether this was the “real” box or the replica (Deadly Possessions 2016). Although I could not get a clear view of the back, they did have several cut-scenes showing the front of the box, as well as some of the contents, which included the granite tablet. It was easy to see the granite tablet within and matched the replica, not the original. In addition, the box had several distinctive scratches on the front doors. The replica has scratches in a similar pattern to the original, but a side-by-side comparison easily distinguishes which box is the replica and original. The box shown in the cut-scenes was also the replica. Although this demonstrated they were using the replica box for filming, I wasn’t sure if the original box was what I saw in the museum. Lucky for me, I was informed that Bagans was going to open the box during his Ghost Adventures LIVE show airing on Halloween night. There was a chance the contents would be displayed in glorious HD; I set my DVR to record the four-hour program and patiently waited. Unfortunately, Bagans didn’t make good on his promise; he never opened the box. However, the broadcast did give me several close-up views of the box under its protective case. I compared these close-ups with high resolution images of the original box taken by Jamie Carroll, the photographer Haxton used for his book (Carrol 2012). As I mentioned earlier, there were several distinct scratches on the front doors of both boxes that identified which was the original and replica. I found the markings do indeed match the original box; at least the box is real (if not the background story). The LIVE event would not be the first time the box was to be opened on Bagans’s TV show. In the episode of Deadly Possessions in which he receives the box, Bagans invited the original owner, Kevin Mannis, to share his experiences. At one point, Bagans puts the box in a basement “isolation room” and asks Mannis to go down and sit in the room to see if any paranormal activity develops. Once in the room, Mannis walks up to the box and doesn’t hesitate to open it. To my disappointment, the box was facing away from the camera and we never get to see inside it. An interesting experience does take place during this segment; Mannis wanders to the back of the dark room (you can no longer see his face) and after a few minutes, he begins speaking with a slight accent and recites a poem. This drives Bagans nuts! Mannis is saying things such as “shadowman,” “I wait here in the darkness,” “in the nighttime till morning I’ll torment your soul …” (Bagans changes this to “Come out of this box and torment these souls”—which was not said). Bagans then sends an elderly man (Theodore) to go in and check on Mannis (not very brave, Zak). Afterward, Mannis claims to have no memory of this experience. The poem that Mannis recites was very well-spoken and seemed well-known to him, even rehearsed. I was already aware of his professional writing and recording work, so this entire experience seemed staged to me. I typed a few lines of the poem into Google and tapped the Enter button. The search results took me to the archived forum of “4plebs” where an anonymous poster solved the mystery (Anonymous 2016). He/she posted a link to a website Broadjam.com, a site for musicians and bands to promote their music online. Kevin Mannis has his own page with eight works uploaded. One of them, called “The Shadowman Part 1” is the exact poem, along with the same accent, he recited on the episode (Mannis 2018). It is important to note the episode of Deadly Possessions aired on April 2, 2016, and Kevin Mannis had uploaded this poem to his Broadjam page four years prior on March 23, 2012. I am the original creator of the story of The Dibbuk Box which appeared as one of my Ebay posts back in 2003. The idea that dibbuk boxes have some kind of history prior to my story, and the idea that a dibbuk box could contain anything other than a dibbuk, along with any deviation to the type of contents I created to be found inside of a dibbuk box is laughable at best. How about this- if you or anyone else can find any reference to a Dibbut [sic] Box anywhere in history prior to my Ebay post, I’ll pay you $100,000.00 and tattoo your name on my forehead. Screenshot showing Mannis admitting he originally created the story. This appears, at least to me, that Mannis admitted creating the story from whole cloth and takes ownership of the story’s creation. This elaborate story that started the entire legend was not an account of real supernatural events, but instead a fictional backstory he came up with to sell an ordinary and incomplete mini bar. A mini-bar? It’s not a Jewish wine cabinet. After seeing the box at the museum, I realized how small it was, measuring approximately 14 ¼ x 12 ½ x 6 ¼ (inches). I became curious (some would say obsessed) whether the racks on the doors could hold wine bottles, as many descriptions would lead us to believe. I searched the all-knowing internet for a few days and finally found a near duplicate online. Then found another and another, all with slight variations of hardware. It turns out that the boxes are mini-bars from the 1950s and 1960s. They included four shot glasses, four highball glasses, and four liquor bottles, all having been made by Robert B. Karoff of New York. Karoff owned a company called Karoff Originals, which was known for its various hostess gifts, kitchen items, and other unique items. 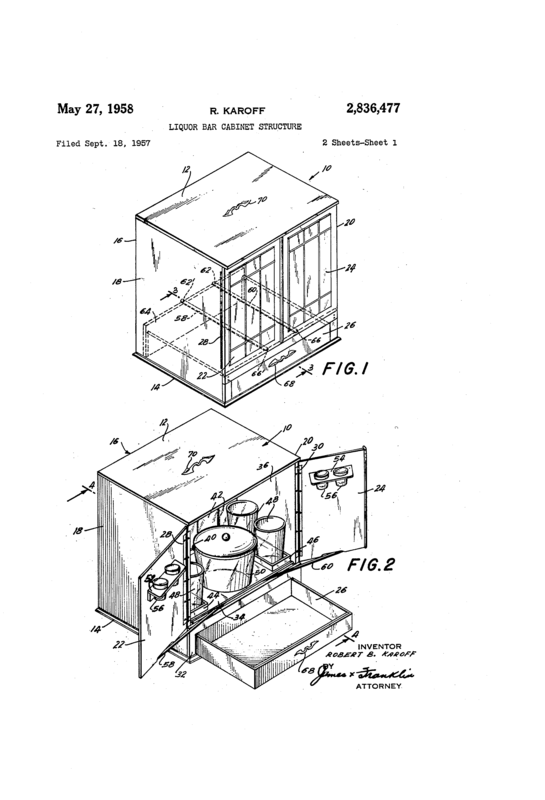 His original design for the “Liquor Bar Cabinet Structure” can be found documented extensively in Patent #2836477, filed on September 18, 1957 (Karoff 1957). Despite what various owners would have us think, the infamous Dibbuk Box is not a Jewish wine cabinet from Spain but instead a minibar from New York. Original sketch design filed with patent 2.836,477 by Robert Karoff for a Liquor Bar Cabinet Structure in 1957. So, is there any validity to the Dibbuk Box being haunted or inhabited by an evil spirit? Absolutely not. 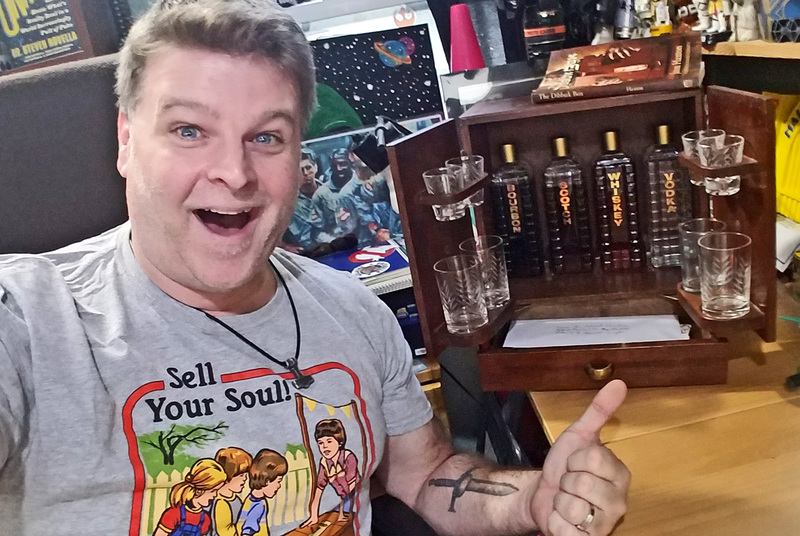 The evidence leads to the conclusion that the Dibbuk Box is nothing more than a vintage mini-bar that began its journey into the paranormal by a story created in 2003 by a professional writer to boost his eBay selling price. The box’s reputation was propelled into paranormal pop culture by a later owner (via a published book) and later by a movie (The Possession). Today, it sits in a museum with paranormal celebrities claiming all sorts of pseudoscientific paranormal activity associated with it, completely ignoring the fact they have been duped by a hoax. Zak Bagans claims that the Dibbuk Box is one of the most haunted objects in the world. He seems to be, at least on the surface, deathly afraid of opening the box for fear of something evil coming out. I would like to sincerely offer my services to Mr. Bagans; I will happily open his Dibbuk Box for him. Think about it, Zak … how cool would it be to show a skeptical guy like me how insanely haunted the box is and not a hoax as all the evidence concludes? My email is listed below, feel free to contact me. By the way, after finding duplicate boxes online, I went ahead and ordered one. So, if you can’t make it to the museum, feel free to stop by and see my Dibbuk Box. Unlike Bagans’s, mine has both high level of proof and spirits in it—rum—because I got the complete set. My Dibbuk Box actually has spirits in it; I call them Rum and Vodka. Anonymous. 2016. So on the new show deadly possessions … .Available at https://archive.4plebs.org/x/thread/17539778/. Biddle, Kenny. 2018. The Not-So-Haunted Museum of Zak Bagans. Available at https://www.csicop.org/specialarticles/show/the_not-so-haunted_museum_of_zak_bagans. Campbell, Hannah. 2012. Jason Haxton “The Dibbuk Box” Part One. Available at https://www.youtube.com/watch?v=ykCOdNdaR_s. Carrol, Jamie. 2012. The Dibbuk Box – Stock Image. Available at https://www.istockphoto.com/photo/the-dibbuk-box-gm157743419-21900517. Deadly Possessions (television show). 2016. Robert the Dool and The Dybbuk Box. Season 1, Episode 1. Air date April 2. Dunnig, Brian. 2014. The Haunted Dybbuk Box. Skeptoid Podcast #428. Available at https://skeptoid.com/episodes/4428. Haxton, Jason. 2011. The Dibbuk Box. Truman State University Press. Kirksville, Missouri. IMDb.com. 2018. Kevin Mannis. Available at https://www.imdb.com/name/nm0543432/. Jewish Virtual Library. 2018. American-Israeli Cooperative Enterprise. Available at https://www.jewishvirtuallibrary.org/dibbuk-dybbuk. Karoff, Robert. 1957. Liquor bar cabinet structure. Patent application. Available at https://patents.google.com/patent/US2836477. Macabre. 2015. 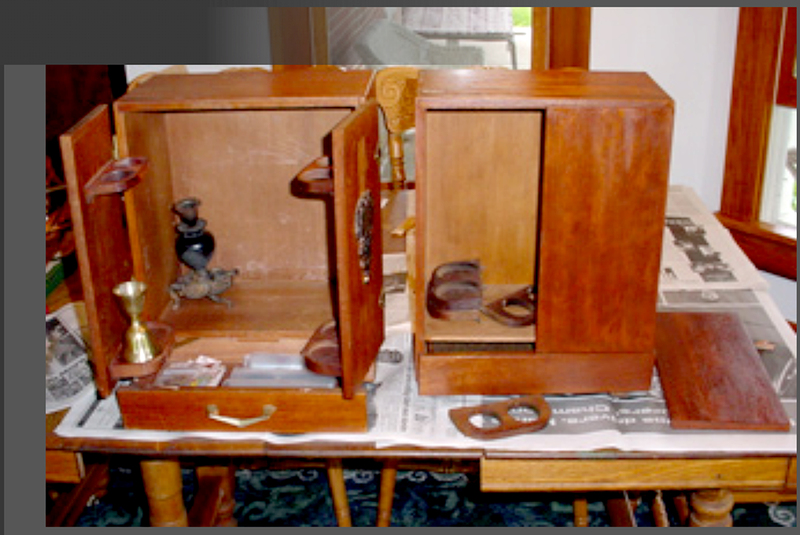 Jewish Pandora’s Box – Dybbuk Box. Available at http://www.paranormalne.pl/tutorials/article/871-zydowska-puszka-pandory-dybbuk-box/. Mannis, Kevin. 2009. The Dibbuk Box; A.K.A. The Haunted Jewish Wine Cabinet. Available at https://web.archive.org/web/20120825053726/http://voices.yahoo.com/the-dibbuk-box-4184199.html?cat=44. ———. 2018. The Shadowman Part 1. Available at http://www.broadjam.com/kevinmannis. Payne, Lucas. 2016. A Cursed Box Gone Viral. Available at http://kirksvilletraditions.weebly.com/the-dybbuk-box.html. Roth, Cecil. 1966. The Standard Jewish Encyclopedia. Doubleday & Company, Inc. Garden City, NY. Pg. 557. Wikipedia. 2018. The Dybbuk. Available at https://en.wikipedia.org/wiki/The_Dybbuk. A column by Kenny Biddle, a science enthusiast who likes to take a closer look at claims involving paranormal experiences, the equipment people use to search strange things, and the evidence presented for ghosts, UFOs, and cryptids. I promote science, critical thinking, and skepticism through his blog “I Am Kenny Biddle” and the in-depth articles on CSI. I am fortunate to frequently host workshops on how to deconstruct and explain paranormal photography/videos and methods to solve mysteries. That quote perfectly expresses my approach to paranormal claims; I am open to it, but there must be solid evidence. Every extraordinary claim is a mystery, and I search through the details looking for clues that will reveal what is really going on. Every investigation is a journey, allowing me to learn new things and discover hidden clues. My column is where I share what I have learned with those curious about strange claims and are looking for a more objective view.